sailboat. : Before things change, just a little bit. And when after an hour or so of furious typing it turns out not to be perfect, well, hello unwelcome feelings of failure. But here's the thing, nothing is really perfect. It's part of the joy of being alive. There are a million and one things going a little bit wrong as I write this, but sometimes going a little bit wrong leads to something that's SO RIGHT and could have so easily been missed. The seeking of perfection is nothing but a giant barrier between thinking about what you want to do and forging forwards and making something beautiful. My favourite things are all things I never even knew I was searching for and I then marvel at how they become things I simply can't imagine my life without. I'm not perfect and when I really think about it, I haven't got it in me to truly, honestly even begin to seek out perfection any more. Instead, I'm trying to seek out moments of quiet, of beauty, of truth in a chaotic world. This isn't perfect. This has never been perfect. It's never needed to be perfect. And I don't think it needs to be perfect now. Because thoughts and feelings are flawed, distorted by all kinds of things. And I know I won't ever be the only person feeling something at a particular time, so if I can just, somehow, reach out and connect with someone somewhere, anywhere, well, it will all have been worth it. This is Beatrix. She's pretty cute. The bottom shelf of all of my bookshelves is now taped off to avoid any more books becoming victims of some particularly effective bunny teeth. If there's something in her path, she will nibble it. She's as sassy and determined as her namesake and she's certainly been giving me plenty of opportunities to work on my patience skills. This is what happens when I try and take pictures now. She pinches things and runs away with them, which is teaching me to be a little tidier. I'm still keeping up with listening to a new album each day. I don't think Beatrix is particularly thrilled when I start to sing along, but she tolerates me. I'm the one with the food after all. Mornflake gifted me a generous parcel of their granola and an array of beauty products. 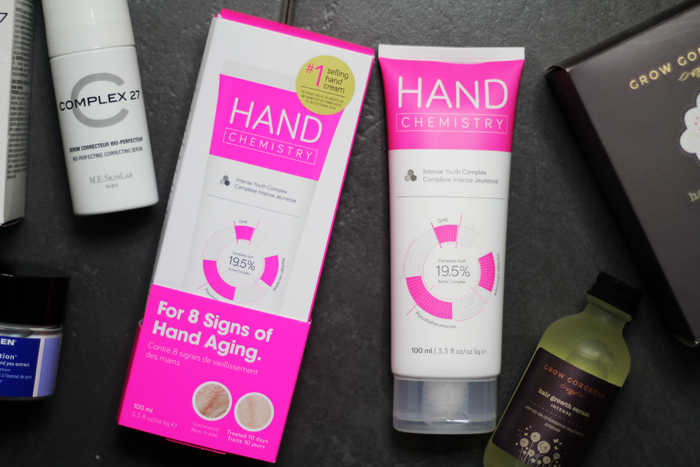 Unfortunately none of the skincare products really worked for me, I was particularly disappointed in the Ole Henriksen moisturiser, but I've found a new favourite hand cream in this one from Hand Chemistry. It's not at all greasy and smells like peaches and apricots. 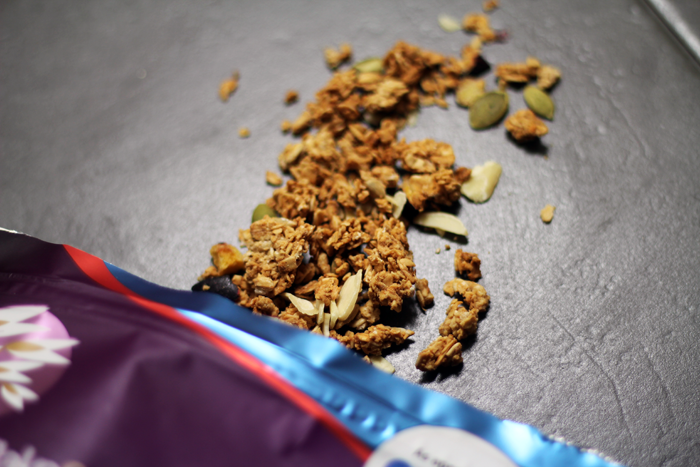 The granola was top notch too. I daren't buy any more because I ended up snacking a bit too generously on it throughout the day. 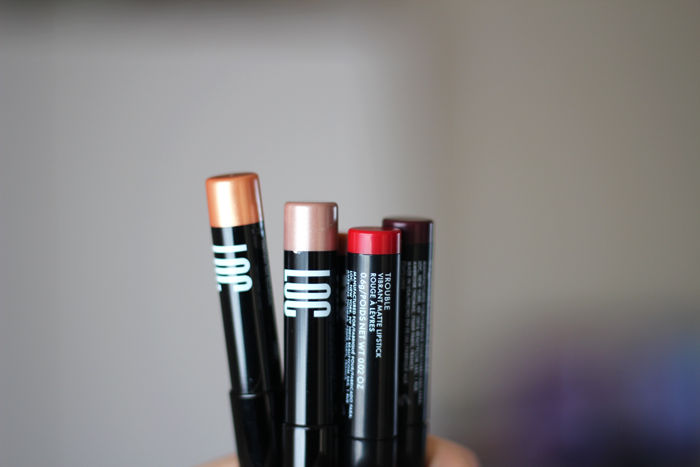 But speaking of nice things, these shadow sticks and matte lipsticks are brilliant. 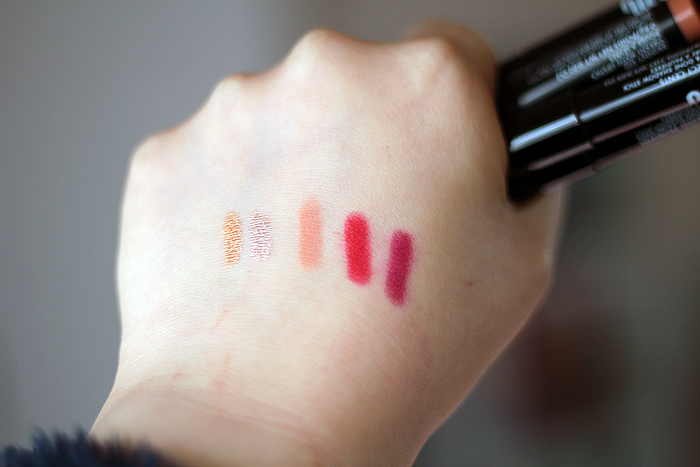 Skinny Dip is exactly my kind of lip colour and the shadow sticks don't smudge off my eyes at all. At all. And that's never ever happened with any eye shadow before. Last year I was sent this super cool space ipad mini case. The only reason I haven't mentioned it before is that it took about three months for the strong smell of ink to finally fade. Maybe because there's a lot of black on it? Probably my fault, I can't exactly say I resized the image particularly well. The cover itself is good though. I drop it all the time and it hasn't smashed to smithereens yet, so thumbs up there. I would dearly love to be able to pop to Boots or somewhere for a new pair of glasses, but all their frames are so samey and look tiny on my giant moon face. And the last time I went the lady helping me enjoyed telling me that she had such a small face all the frames looked nice on her. I didn't know what to say to that. So I said I was pleased for her. And I am. Good for her. Needless to say I haven't been back there. But the above frames are the Derek Cardigan's from Lensway and they're perfect. My reading this year so far has been a bit, well, meh. 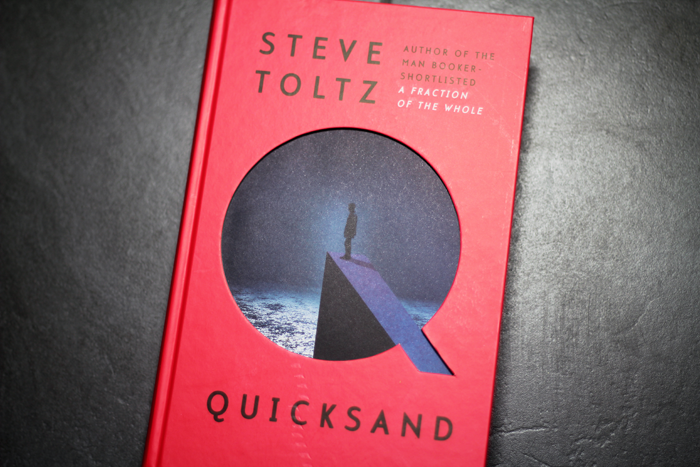 The main highlights though have been a reread of Ariel by Sylvia Plath which always makes me feel more feelings than I've felt all together in a long time, and Quicksand by Steve Toltz which so far is tragic, funny and well, tragically funny. 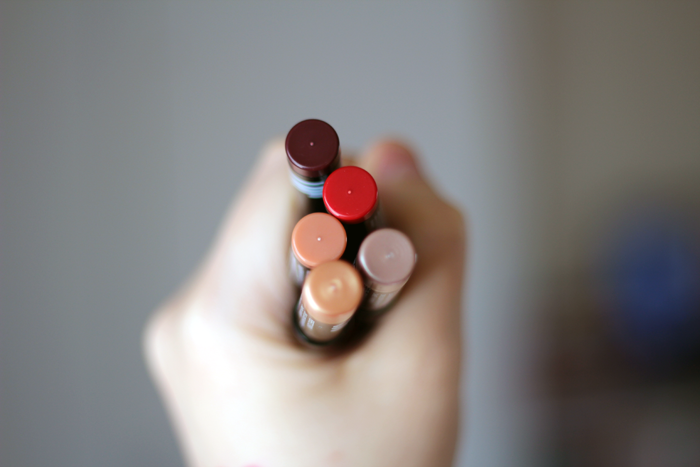 Shadow sticks and chubby lip pencils are my new go tos. Why the hell were we faffing around with little pots and awkward square tube things when we could just use one of our most practiced skills: using a pen/pencil, to get us looking dope. Beatrix is the prettiest thing! 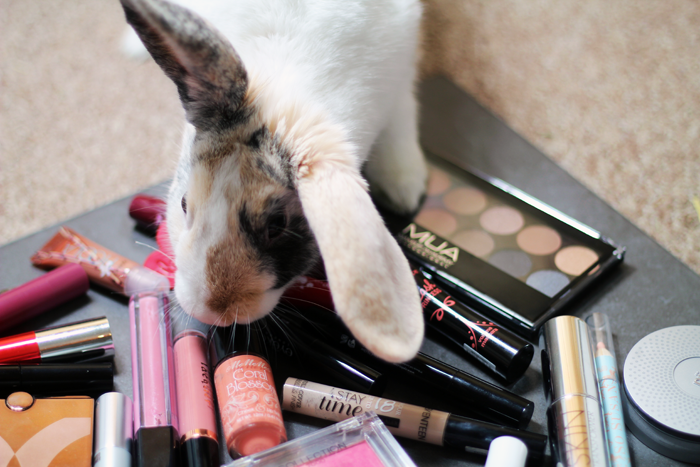 It must be so hard to stay mad at her when she nibbles and steals things! 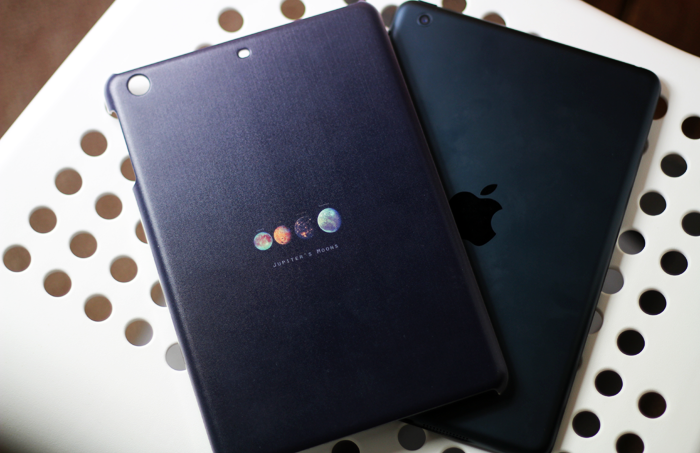 And I love your iPad case with the planets on it! 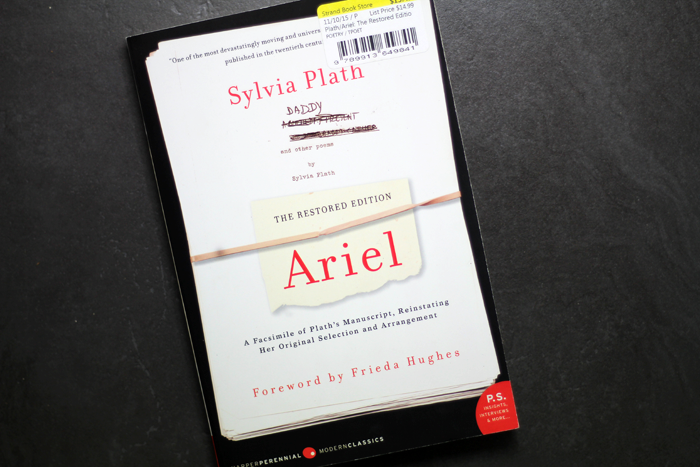 Beyond happy to see a post from you, and it was a lovely read. Oh my gosh, just look at little Beatrix! SO beautiful! Love the look of those glasses, J. And I can't wait to see your secret new bits for the blog! 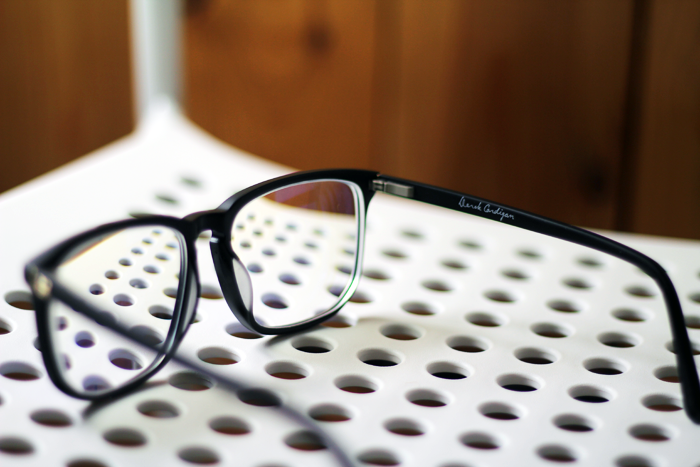 I've definitely had more than one of those moments in opticians before, but yes, it definitely does something and it does it very well! Thank you lovely, I hope you are too! 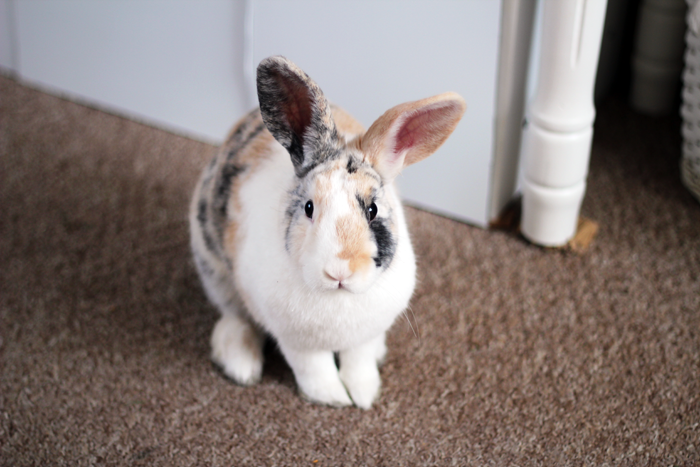 Your new bunny is just the cutest!! <3 Bea is so beautiful!